CAPSULE REPORT: If you love macaroni and cheese, you’re in good company. Thomas Jefferson and Ronald Reagan had their own recipes for the “best” macaroni and cheese. 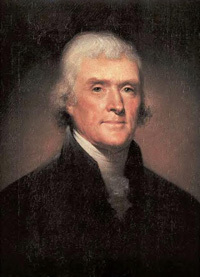 In fact, while Jefferson was not “the father of our country,” he was most likely the father of mac and cheese! Here, some history and historic recipes for one of our favorite foods. This is Page 1 of a two-page article. Click on the black links below to visit other pages. The father of macaroni and cheese, one of our favorite comfort foods, was not a chef or even Italian. But he was someone known to enjoy his creature comforts—and he invented a lot of them. In 1787, Thomas Jefferson, perhaps our country’s greatest Renaissance man, returned to America from his tour as minister to France. He brought back a pasta machine acquired in Italy. He proceeded to invent a better pasta machine, and undoubtedly many recipes as well. In documents in the Library of Congress, one guest reports dining dining on “a pie called macaroni*,” an early version of what we know as Baked Macaroni and Cheese. The macaroni was cooked until almost done, then combined with melted butter, salt, and grated white or yellow cheese and put it in the oven for 15 minutes or more. * The song “Yankee Doodle” has mistakenly come down to us with the word macaroni, pasta, instead of the original word, maccheroni, foppish. He put a feather in his cap and called it stylish—not pasta! In a related mistranslation, Cinderella ended up with fantastic slippers of fantastic glass (verre) instead of a typical aristocratic’s shoes lined with fur (vair). But, we digress. 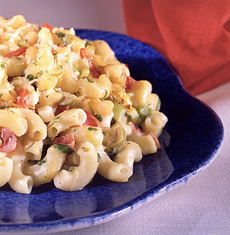 For a full discussion of the meaning of “Yankee Doodle,” see macaroni in our Pasta Glossary. Jefferson had his staff add American or English Cheddar cheese; and while we enjoy that classic (especially with sharper, aged Cheddar), we have come to prefer two variations: goat cheese and truffle cheese. Any chèvre lover will bleat for joy over the delicious nuances provided by tangy, aged goat cheese. But for a real slam dunk, turn to earthy truffle cheese. Use truffle butter in the recipe, too. Imagine: a pasta fix and a truffle fix in the same dish! You’ll never look at mac & cheese the same way again. You can adapt the recipe below with the truffled ingredients, eliminating the Worcestershire sauce. And, don’t confine yourself to elbow macaroni. Corkscrews, penne, or any chunky, shaped pasta makes the dish as artistic as it is tasty (we like use tri-colored shapes as well).